Thanks to all those who supported the first Inter-County Bounty. The excel contains the scores of all participants to date alongside their top scorers. Also outlined are the full scorers from play in both the Leinster and Munster Championships. Joe Bergin currently leads in Leinster with a four way tie the case in Munster. Muckalee & St Martins club collectors will be calling to all houses in the parish promoting the buy a brick campaign in aid of new dressing room development at our field in Muckalee. We ask for your continued generosity in buying a Brick @ a cost of €100 for which your name will be prominently displayed on the wall of our new clubhouse. Larry Maher Chairman Muckalee Football club John Ryan Chairman St Martins Hurling club. What a way to start the year for the Seniors! The lads showed massive determination from the first whistle and battled right to the 4th minute of injury time to start their championship campaign off with a vital two points. Playing with a strong breeze in the first half, we put some quick points on the board through John Maher, Tom Breen and John Mulhall. With probably the youngest midfield pairing in the county, Shane Kinsella and Brian Coady hurling a world of ball, we remained on top to lead 0-8 to 0-2 at half time and but for some bad wides in the tricky breezy conditions we could have been further in front. The chat on the bank at half time was whether or not 6 points would be enough for victory. As things turned out, it wasn’t ….. but then it was . Playing with the wind in the 2nd half, it took a fantastic point blank save from Colin McGrath from Dicksboro’s first attack to avoid what would have been a sucker punch start. The ‘Boro steadily eroded the deficit and pulled ahead with only minutes to go. The lads showed tremendous determination and fought for every ball and got one last chance when we were awarded a free 50 yards out. Knowing that only a goal would do, Colin floated a perfect ball in to the edge of the square and somehow the ball ended up in the back of the net. The half back line of Paddy Nolan, Brian Byrne and Mick Morrissey had a great game and with Shane, Brian and Tom Breen working tirelessly around the middle of the field we got our just rewards. It’s important that we don’t get carried away, but we should also celebrate a great team effort and performance and we can now look forward to Bennettsbridge in a couple of weeks in round 2! On a bitterly cold evening, the Juniors of St Martins and Tullaroan ( not Thomastown  ) served up a highly entertaining match in the Junior League. The local lads put in a great effort for the entire sixty minutes and fully deserved their win. A lively start from Donal Shore with an early goal and with Shane Kinsella keeping the scoreboard ticking over from placed balls we went in in front on a score line of 1-8 to 1-7 at half time. It was nip and tuck for most of the 2nd half with no quarter asked or given. David and Thomas Walsh repelled many Tullaroan attacks as they went in search of an equalising goal during the last ten minutes. St Martins finished strongly with great points from play from Donal Shore, Martin Dowling and Robert Reid, while Jason Shore put the final nail in the Tullaroan coffin with a late goal. Next up for the juniors is the first round of the league – championship against local rivals Erins Own next Friday evening. Carrickshock were the visitors to Muckalee for this Junior Football League game and they went away with the points.Three goals scored in the opening half gave the visitors a big advantage at the break 3-4 to 0-2. Muckalee kept trying and scored two goals from Conor Dowling and Mark Murphy, final score 3-12 to 2-5. Team Brian Cahill, Brian Cadigan,Nicholas Purcell, Alan Murphy, Conor Dowling, Conor Kinsella, Eoin Murphy, James Kelly, Mark Murphy 1-0, Eugene Maher, Loughlin Hogan, Shane Kinsella 0-2, Shane Dowling 0-2,Damien Tynan, Danny Quirke, Jason Shore 0-1. 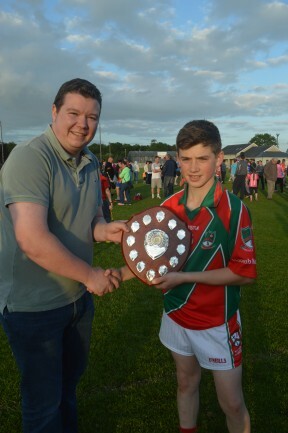 Kilkenny Bord Na nOg PRO Patrick O’Flynn presents The U14 Team Captain with the Duggan Steel U-14 Roinn B League Final Trophy after defeating Clara in the final.